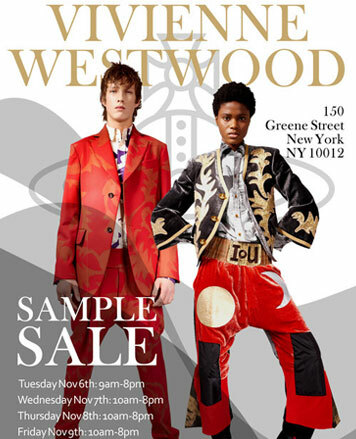 WHY: Women's and men's ready-to-wear and accessories from the iconic British designer at a discount at the Vivienne Westwood Sample Sale. Know before you go. Check out Pics from Inside the Vivienne Westwood Sample Sale. Dame Vivienne Westwood's popularity knows no bounds. Her punk attitude is more alive now than in the movement's Seventies heyday and her outspoken, Union Jack waving Englishness (with a few added safety pins and tea stains), is undiminished. Cutting edge but classic, her collections are unflinchingly rooted in her interests and beliefs, whether it is human rights or classical fiction.